A family joins an expedition to prehistoric times, in an effort to save the human race. Terra Nova could be the miracle that saves genre television... or it could be a schlock-fest. Our first clues come from four publicity photos. From executive producers Steven Spielberg, Peter Chernin, Brannon Braga and David Fury comes an epic family adventure 85 million years in the making. TERRA NOVA follows an ordinary family embarking on an incredible journey back in time to prehistoric Earth as a small part of a massive experiment to save the human race. In the year 2149, the world is dying. The planet is overdeveloped and overcrowded. With the majority of plant and animal life extinct, devotion to science has brought mankind to the brink of destruction, but has also provided its only hope for salvation. The series centers on the Shannon family as they join the tenth pilgrimage of settlers to TERRA NOVA, the first colony of humans in this second chance for civilization. 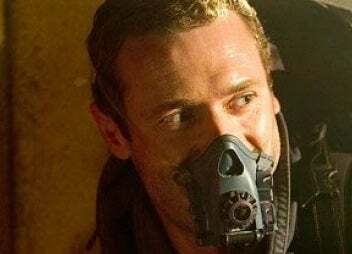 JIM SHANNON (Jason O'Mara) a devoted father with a checkered past, guides his family through this new land of limitless beauty, mystery and terror. Jim's wife, ELISABETH SHANNON, is a trauma surgeon chosen through a global lottery as a new addition to Terra Nova's medical team. JOSH SHANNON is their son, mourning the girl he left behind, as he's torn between two role models: his father, Jim; and the charismatic COMMANDER FRANK TAYLOR, the heroic first pioneer through the time portal and leader of the settlement. MADDY SHANNON, Jim and Elizabeth's teen daughter, is as independent and adventurous as her parents, but her distrust of authority soon leads her on a dangerous path. But perhaps even more threatening than what lies outside the protective walls is the Shannons' realization that something sinister may be happening inside TERRA NOVA. It seems that not everyone on this mission has the same idea of how best to save mankind. TERRA NOVA is produced by 20th Century Fox Television, DreamWorks Television, Kapital Entertainment and Chernin Entertainment. Steven Spielberg, Peter Chernin, Brannon Braga, David Fury, Jon Cassar, Aaron Kaplan, Katherine Pope, Justin Falvey and Darryl Frank serve as executive producers. Craig Silverstein and Kelly Marcel serve as executive producers on the pilot episode, and Alex Graves will direct the pilot.